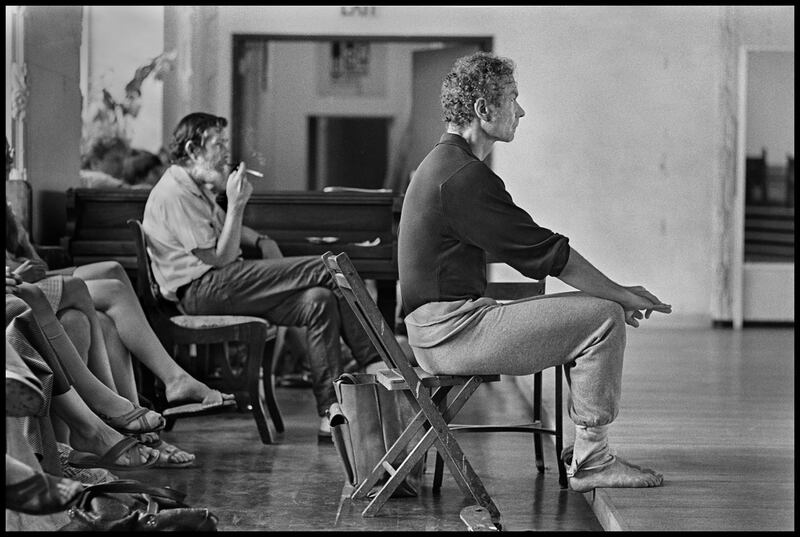 Westbeth, 1971, John Cage and Merce Cunningham Photo©James Klosty. MERCE CUNNINGHAM stood at the nexus of classicism and modernism the way Russian-born choreographer Michel Fokine stood at the nexus of classicism and romanticism. Cunningham stripped his choreographic process of all but the essential element of movement, excluding decor, narrative, music—anything decorative or extrinsic. These were later added back, their invention left to others—including John Cage, Robert Rauschenberg, and Jasper Johns—without much, if any, collusion. All but an early few of his 150 works were made in silence. The independence—indeed the primacy—of choreography thus established, Cunningham next began to break down movement into increasingly small increments and began to divide up the body as well. To the lower-body positions of ballet, he added a flexible and dynamic torso; later, he would choreograph for the arms without regard to the lower body, giving them “facings” and directions all their own. The same, too, for the head. Meanwhile, he broke dance out of the proscenium and began to assemble and reassemble his dances without regard to a “front,” fracturing and refracting the stage picture in the way that Cubists broke up the visual plane of a painting. This fragmentation mirrors the breakdown of syntax and the concurrent notions of simultaneity and multiplicity of associations that arose in modernist literature, and in computer coding the breakdown of information into digital bytes. Cunningham was also an early adopter of new technologies, including video and computer programming. All along, his use of chance procedures at some point in the making of every piece was a way to remove some of the effects of personal choice and habit and willful control, and can be viewed as a kind of personal Taoism. Cunningham was born in Centralia, Washington, one of three sons of a lawyer father and a gadabout mother. He first studied dance with the vaudevillian Maud Barrett, then studied modern dance at Seattle’s Cornish School, where he met Cage; in 1939, at the Bennington School of the Dance at Mills College in Oakland, California, he met Martha Graham, whom he followed to New York. In the summer of 1953, while in residence at Black Mountain College in North Carolina, he formed the Merce Cunningham Dance Company. Winning accolades and honors worldwide, and touring the globe until has last year, he remained a devoted New Yorker all of his life, sharing a loft for many decades with John Cage. Two weeks before he died in July 2009, at age 90, he was in his studio with his dancers, working on something new.